Each year, we gain a slightly better understanding of the nature of the universe and our place in it. FOR MOST OF US, the mapping technology we use on a daily basis is limited to dash-mounted GPS units. No disrespect — I mean, just 10 years ago we were dependent on hard-copy road atlases to get where we were going; cutting-edge meant route-finding in Mapquest and then printing off the pages. But as you read this, hundreds of teams of scientists are working with vastly more complex technologies to map everything from the far reaches of the universe to the most infinitesimally small particles within it. Just a few weeks ago, astronomers using the still-under-construction ALMA observatory (pictured above) made a major discovery about the nearby Fomalhaut system — basically, that it probably contains a bunch of Earth-sized planets. What follows is a listing of similarly momentous discoveries about the makeup and layout of our universe, and descriptions of the latest technologies in astronomy, particle physics, and marine science that have made them possible. The Hubble and Spitzer Space Telescopes have been rocking it for 22 and 9 years, respectively. They’re responsible for producing the incredible deep-space images we’re all familiar with, some of which are included below. But Spitzer has already exhausted its reserves of liquid helium, required for its primary operations, and Hubble is only expected to last another two years. James Webb is their successor. With different phases of construction underway in 17 countries, the James Webb Space Telescope is scheduled for completion in 2018. Its design features 18 gold-coated hexagonal mirrors, which will focus light from super-distant target sources and capture high-res visible and infrared images. In theory, this means it will be able to see the most distant objects in the universe, such as the first stars and galaxies to form following the Big Bang. 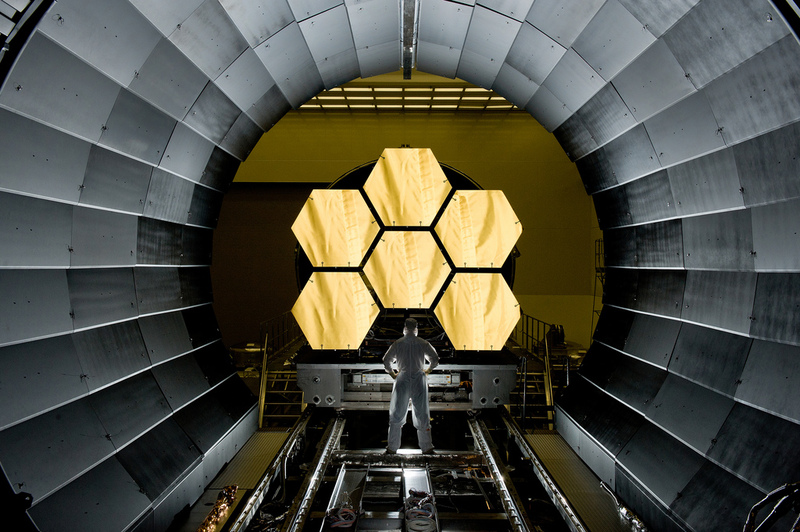 In the picture above, “NASA engineer Ernie Wright looks on as the first six flight ready James Webb Space Telescope’s primary mirror segments are prepped to begin final cryogenic testing at NASA’s Marshall Space Flight Center in Huntsville, AL.” Functionality must be tested in conditions similar to those experienced within James Webb’s target orbit, 930,000 miles straight up. In some obvious ways, the Milky Way is the galaxy we know best. All of its constituent elements are much, much closer to Earth than their counterparts in foreign galaxies. But when it comes to comprehending the overall shape and makeup of the Milky Way, the task has always been difficult — precisely because we’re right in the thick of it. As recently as 1785, astronomers did this by counting individual stars as seen from Earth and plotting them on a crude galactic map. Later, the real breakthroughs came from observing other galaxies and realizing they mostly conform to one of three main structural types. The Milky Way was determined to be of the spiral variety, with a thick bar bisecting its central bulge. The introduction of radio telescopes mid-20th-century allowed astronomers to measure the hydrogen output of various sectors of the galaxy, leading to more accurate mapping of the spiral arms and barred center. As shown in the graphic to the right, our sun is located in the Orion Arm. When you see the Milky Way at night, you’re looking edge-on and inward through the Sagittarius, Scutum-Crux, and Norma Arms towards the dense galactic nucleus. Contemporary revelations about our galaxy come courtesy of the Hubble and Spitzer Space Telescopes. The infrared composite above combines images from each technology to create the most detailed picture ever captured of this region of space. While the dimensions of the photo embedded here are 900×349 pixels, they represent an area 300×115 light-years in size. The galactic center was known to comprise three large clusters of massive stars, but this image shows plenty more gigantic individuals distributed well beyond the boundaries of the clusters. It’s also generally accepted that a supermassive black hole is hiding somewhere in this central region. It took Hubble 144 orbits of Earth and 2,300 exposures to generate the high-res mosaic above. This is the piece of technology responsible for all the pretty space pictures. Kinda looks like a tin can with some foil wrapped around one end. Or a really expensive burrito. Hubble took 11 years to build and was launched in 1990. Just weeks into its mission, it became obvious that the measurements of the telescope’s primary mirror were off — by 2.2 micrometers. Fortunately, Hubble was designed to accommodate in-orbit servicing. In 1993, corrective optics were installed by the crew of the Endeavour, bringing the instrument up to original design standards. The photo above was taken during a final scheduled servicing mission in 2009. In terms of advancements made in both scientific and lay understandings of the universe, the Hubble Space Telescope is without a doubt the most significant mapping technology ever utilized. Among the major achievements of Hubble is this survey — a composite of 800 exposures taken over 11 days, directed at an otherwise “empty” slice of sky within the constellation Fornax. Each of the points of light visible in the Hubble Ultra Deep Field shot is a galaxy very, very far away. Their light as seen in the image to the right traveled for 13 billion years before impacting Hubble’s sensors and creating this image. That means by looking at this, you are observing the universe as it was just 400-800 million years after the Big Bang. There are 10,000 galaxies in the picture. It displays an area of sky just 1/10th the diameter of the full moon as seen from Earth. You don’t need to do the math for that to blow your mind. Do yourself a favor and click to expand this one. Not only has Hubble given us the deepest image of the universe ever recorded, helping astronomers more accurately determine the age of the universe, it also has played a key role in how we measure the universe’s rate of expansion. Since the work of Edwin Hubble in the late 1920s, we’ve known that the universe is expanding — the distance between every object in the universe is increasing. The rate of this increase, however, was disputed until only recently. In the past several years, Hubble Telescope data from astronomical objects like supernovae (such as the Crab Nebula, pictured above, the remains of a stellar explosion that occurred in 1054 AD) have led to dramatically more accurate measurements of the Hubble Constant, the mathematical representation of the rate of expansion. In other words, data from Hubble is both creating more detailed maps of our universe, and helping us understand how those maps are constantly changing. Up at 13,796ft on the summit of Mauna Kea on the Big Island of Hawaii sits this collection of internationally owned observatories. It’s a prime spot for stargazing, as the humidity in the area is generally low, and whatever water vapor there is mostly hangs in clouds below the summit. A pre-sunrise visit to the facility has become a popular tourist activity. There are 13 telescopes in total, including the Keck pair, two of the largest optical telescopes in the world. Researchers use the observatories to chart everything, from newly discovered satellites in orbit around Jupiter, to features of our sun, to galaxies “from the dark ages.” They’ve also created wide-field zoomable images of the sky. As with the Milky Way, our understanding of other nearby galaxies is constantly being advanced by new technologies. Pictured to the left is a small region of the Large Magellanic Cloud (LMC), the third-closest galaxy to our own at a distance of around 160,000 light-years. Specifically, the Tarantula Nebula is being showcased here. This is the largest and most active star-producing region in our galactic neighborhood, making it incredibly luminous and of incredible interest to astronomers as they study how stars form, evolve, and ultimately die. Some of the bright blue stars shown are the largest yet recorded, with masses over 100 times greater than the sun’s. The LMC was visible as a vaguely bright haze to early astronomers — hence the “cloud” terminology. It wasn’t until the Hubble, though, that we were able to resolve tight clusters like the Tarantula Nebula as individual stars and see exactly what was going on in this phenomena-rich galaxy. Most of the universe mapping that takes place isn’t done within the spectrum of visible light, and doesn’t necessarily result in attractive or accessible images. NASA’s Kepler Mission, which utilizes the orbiting Kepler telescope, has the stated purpose of discovering nearby Earth-like planets, thereby giving a more accurate estimate for just how many such planets may exist within the Milky Way. To be “Earth-like,” a planet must have a size similar to ours — large planets are obviously easier to spot, but are composed of gas (like Saturn and Jupiter) as opposed to solid materials. Additionally, and most importantly, the planet must orbit within the “habitable zone” of its star, with surface temperatures that would allow the presence of liquid water. In late 2011, confirmation of the first such planet, Kepler-22b, was announced, and the mission has already identified over 2,000 other candidate planets. Scientists now believe there are probably around 100 Earth-like planets within 30 light-years of us. Ten years of sky scanning carried out by ground-based telescopes of the 2MASS Redshift Survey (2MRS) resulted, in 2010, in the most complete map of our local universe to date. The 3D image above plots 43,000 galaxies, with their distance from us represented by the colors in the key at bottom right. The 27 separate radio antennas of New Mexico’s Very Large Array, each surrounded by a dish 82 feet in diameter, work in concert to effectively create one massive observatory antenna with a diameter of 22 miles. The VLA has been fully operational since 1980, and a significant hardware upgrade completed last year has increased its technical capacities by a factor of 8,000. The facility was renamed to reflect this significant improvement (the new name is the Karl G. Jansky Very Large Array). Over the years, the VLA has charted super-distant quasars and pulsars, studied black holes and planet-producing star systems, and traced the movement of hydrogen gas in the center of our galaxy. It is not involved — regardless of what you saw Jodie Foster doing in Contact — in the search for extraterrestrial life. Current theories hold that more than 80% of the matter in the universe isn’t like the stuff we interact with or observe every day. This ubiquitous matter is “dark,” and it can’t be directly observed by any of the technologies in this list. Instead, astronomers must measure the effects of dark matter on galaxies and other observable phenomena. One such effect is called gravitational lensing, which occurs when the light of distant objects is bent around a massive object (in this case, a huge amount of dark matter) by the gravity of that object, looking to us on Earth as if it were passing through a curved piece of glass. This is what’s happening in the picture of Galaxy Cluster Abell 1689 to the right. Our view of these galaxies is being distorted by the dark matter present in the cluster (represented as the purple glow). Using images like this from Hubble and other sources, and comparing the degree of lensing to how the galaxies would appear normally, astronomers are in the process of creating a 3D map of the universe’s dark matter. While an impressive array of technology is pointed upward to further our understanding of the universe beyond, equally intensive research is being undertaken to fill in the gaps in our knowledge of this planet. It’s only been a few decades that scientists have been able to produce accurate maps of the seafloor and the variety of features found there, starting with the use of militarily developed sonar post-WWII. Today, traditional sonar is employed in conjunction with other techniques, such as magnetic mapping. This is one of the capabilities of the Sentry autonomous underwater vehicle (AUV). However, while previous magnetic survey instruments were towed behind ships at surface level, Sentry is designed to operate 100m above the seafloor, at depths of up to 5km. This proximity, combined with its super-sensitive magnetometer, produce seabed maps of unprecedented detail. Sentry has been used to map potential sites for an underwater observatory off the coast of Washington State. Its environmental sensors were also put to use during surveys of the Deepwater Horizon oil spill. On March 26, film director James Cameron made history by becoming the first person to solo dive to Challenger Deep, the most remote area of the Mariana Trench and the deepest place on Earth (seven miles straight down). Cameron did it inside his very own deep-sea submersible, the Deepsea Challenger, which was built in secrecy over the past eight years. While he reportedly didn’t see much during the seven-hour dive, his team returned without him a few days later and captured the image to the right, which depicts the Deepsea Challenger and was taken by the unmanned companion “deep-sea lander,” whose bait is probably responsible for attracting the creature seen in the image. For a fun frame of reference on just how deep we’re talking, check out this graphic. At 35,756 feet, Challenger Deep is deeper than Everest is tall, with a mile to spare. That’s way further than the depth at which, “if you shoot a hole in a pressurized SCUBA tank, instead of air rushing out, water rushes in.” Way deeper than where giant squids and sperm whales battle, and more than twice as deep as the resting place of the Titanic, which Cameron visited in 1995. Other projects are underway to design and construct vessels that can travel to the very bottom of the ocean, most notably Virgin Group’s DeepFlight Challenger. Maybe the possibility of a package deal on a suborbital flight with Virgin Galactic and a trip down the Mariana with Virgin Oceanic isn’t that far off. From maps with scales infinitely large, to those infinitesimally small. The Large Hadron Collider, brought online in 2008 as the world’s biggest particle accelerator, seeks to prove the existence of the hypothesized but as yet unobserved Higgs boson particle. It’s all connected. Dark matter, which makes up 83% of the universe, is composed of a subatomic particle that can barely be theorized about. An electron in orbit around an atom in your body could simultaneously be in orbit around the center of the galaxy. In looking at this list and thinking about how far the technology has come even in the last 10 years, it’s impossible to predict the revelations of the next 10.